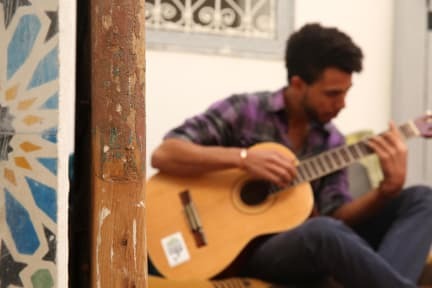 The Earth Hostel was created by a young Amazigh (Berber) man, who loves the idea of gathering people from all nationalities together, so he decided to take the challenge and create a hostel where people from all corners of the globe who wish to experience the wonders of Morocco can meet, share, create and enjoy the unique Moroccan vibe. 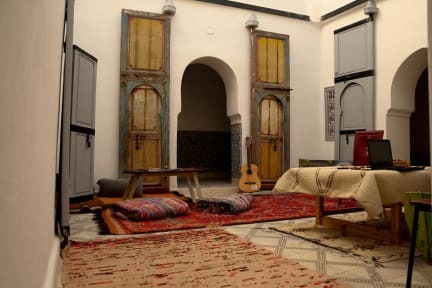 Earth hostel offers 24/7 reception, luggage storage, free wifi, kitchen,laundry and standard showering facilities as well as a new roof terrace where new friends can gather and reminiscence about their daily Moroccan adventures. There are also various activities available, including cooking classes and a variety of excursions to satisfy every traveler. Rooms vary from 8 to 4 communal dorms, and only 8 minutes walk from the main square. Earth hostel prides itself on having a unique relationship between staff and guests, connecting with clients on a personal level, offering a comfortable home away from home. The interior design has an eco-focus, with many of the decorations repurposed from recycled and discarded items. 1)Once you get to the main square (jamaa el fana), find cafe de France, with the cafe on your right head straight, you will pass cafe Montreal on your right, continue straight in to the market (Souk el Kassabine). 2)Take a left towards the Berber market, follow the road straight and around to the right and then take the first left. Earth Hostel is a perfect place to stay: quiet, clean, and with an helpful staff ready to answer every question. I really reccomend it. I only booked one night at this hostel, then I decided to book several days because I really enjoyed it. The staff is really friendly and the breakfast is great. The cleanliness is excellent and you will immediately feel at home. The hostel has a roof where you can drink tea and enjoy a moment in peace. I really recommend it. Earth hostel it's not just an hostel, it's a place to share stories and to meet a lot of people. Super friendly, really close to the main square. If you like to travel, if you like to have some new friends and enjoy a delicious breakfast on the rooftop, Earth hostel is a place for you. Ostello molto carino, molto pulito, letti comodi. Si trova in posizione centrale a soli 5 minuti a piedi dalla piazza principale. Al contrario di quanto letto nelle altre recensioni la struttura si trova facilmente e le indicazioni fornite dalla struttura corrispondono perfettamente. Atmosfera familiare e gestori fantastici! Ci torneremo! Grazie ancora ragazzi della vostra accoglienza, simpatia e disponibilità ....Eleonora, Francesca and Serena from Italy. Auberge situé dans la médina, pas trop dur à trouver ! Personnel accueillant et très sympa. Chambres fraîches et propres. Il y a une belle terrasse pour se poser et des canapés dans l’entrée. J’y rienviendrai sûrement !! Ostello carinissimo in centro a Marrakech, anche se in una vietta un po' difficile da trovare. Personale gentilissimo e molto disponibile, letti molto comodi e la struttura è bella e tipica marocchina.